Everyone loves a well-planned birthday party, and guests and family alike enjoy celebrating with their friend or relative on their special day. Everything from the decor to the food to the lighting play a part in the ambiance of a birthday party, and at Lumen Lighting in Utah, we love helping people design the perfect venue for their party. If you have a milestone birthday coming up, or you’re in charge of planning a surprise for a loved one, contact us today! A person celebrates many milestones throughout their life, but none are perhaps as memorable as a milestone birthday. Reaching the age of 30 is perhaps the first “true” milestone, and people do all sorts of things to celebrate. They may take a trip to a destination they’ve always wanted to visit, or they may plan an intimate party with friends and family (or let their significant other handle the planning). If the choice is to keep things local, why not add a touch of class with bistro lighting or string lights? We can provide the drapery, lights, and illuminated foliage that will make your venue look spectacular. Other milestone birthdays, such as turning 40 or 50, can be a great time to gather those whom you haven’t seen for a long time. While in your younger years you may have opted for a night out on the town for your birthday, now you simply want a small party with family that has good food and good conversation. No matter what size of venue you choose, or if you decide to host the party in your backyard, we can provide expert illumination. 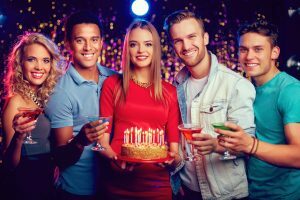 Perhaps you’re not the one celebrating a birthday, but you’re in charge of planning a surprise party for a spouse, relative, or significant other. The logistics of a surprise can be overwhelming, not to mention the task of making sure everyone keeps quiet about it. If you want professional party lighting, we’ll make sure to contact you at a discrete time when you can talk details and dates. As the party date approaches, we’ll work with you on setting up the lighting, drapery, and more. We’ll also make sure that everything is ready to go by the time the man or woman of the hour arrives. We want them to walk into a beautiful space where their friends and family are waiting to surprise them and celebrate their special day. At Lumen, we love partnering with people who are planning a birthday party that they want to be memorable. Our lighting packages can be designed for both indoor and outdoor spaces, and we know that once we’re finished, you’ll love the completed design. Look through our site today to get a better idea of what we can offer, and when you’re ready to book your event, contact us using the form below, or call us at (801) 683-2100. A member of our team will gladly answer all of your questions and help you find the best options.